We’re down to the nitty-gritty, folks: there is 1 Day Until Pitchers And Catchers Report (yes, I’m aware there are already players running around the grounds of Tradition Field in Port St. Lucie — but they are doing so on their own accord). 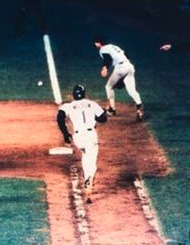 In honor of this auspicious day, we focus on former #1 Mookie Wilson. How can you not like a guy named “Mookie”? The fact that he was actually good didn’t hurt, either. Mookie was the lone source of excitement on the really bad Mets teams that opened the 1980s — but at the same time, he symbolized the hope and optimism we Mets fans so desperately clung to back then. As a leadoff hitter, he struck out far too often and didn’t take nearly enough walks. But that was what speedy leadoff hitters did in the late 1970s and early 80s (see: Omar Moreno, Mickey Rivers, Al Bumbry, Bake McBride, Lou Brock, et al). It was a different time, so it’s hard for the youngins to understand, but basically it worked like this: you put a guy with disruptive basestealing skill at the top of the lineup, regardless of OBP, because if he gets on base he’ll wreak havoc with the minds of the pitcher and catcher, break their concentration, and induce more fastballs thrown — to the best hitters in the lineup (#3 and #4). The strategy doesn’t make sense now, because MLB talent is diluted and the pitchers stink. But back then, when pitchers dominated, it wasn’t the worst strategy in the world — no matter what Bill James says. William Hayward Wilson gave a preview of what was to come during a 27-game audition in 1980, when he was inserted into centerfield and penciled into the leadoff spot on September 2 and left there through the end of the year. It was a smart move, especially considering that the alternative was Jerry Morales. Mookie electrified Shea Stadium with his blinding speed and balls-out approach to the game. He hit only .248 but it felt like .400 — maybe because he and Wally Backman were the first legitimate, home-grown position prospects since Lee Mazzilli became a regular in 1977. Wilson remained the starting centerfielder until he tore cartilage in his shoulder in 1985, opening the door for another speedy, homegrown centerfielder — Lenny Dykstra. Wilson and Dykstra platooned in ’86, a situation that turned Mookie into a more valuable player and helped the Mets win the World Series. By then, Mookie was 30 years old and beginning to break down, but Davey Johnson was masterful in keeping him fresh and extracting great performance from the Mook. Wilson responded with the three highest batting averages, OBPs, and OPS totals of his career from 1986-1988. To top it all off, Mookie Wilson was a gentleman, humanitarian, and caring teammate — in short, an ideal role model for all ballplayers to imitate. To this day it’s difficult to find someone who has a bad word to say about Mookie, and it’s hard to find someone who doesn’t smile at the mention of his name. Though there may be some pessimism about this upcoming season, the fact that Mookie Wilson will be standing in the first base coach’s box is one reason to look forward to it. Which #1 do you remember best and why? Leo Foster? Gene Clines? Bobby Pfeil? Vince Coleman? Esix Snead? Lance Johnson? Fernando Vina? Anderson Hernandez? Chuck Carr? Someone else? Share your memories in the comments. Next Jenrry Mejia As Reliever? Ah yes, legendary Lou Thornton … Rule 5 in the draft, #1 in our hearts! Well it’s not the full list. Tomorrow is #0 for Rey Ordonez. Are you happy that you’ve ruined the suspense for everyone else? Sheesh. Well it could have been #00 for Tony Clark. Rey Ordonez was a zero, alright. To this day, I still cringe for the handfuls of souls who had the audacity to argue his case vs. Derek Jeter back in H.S. In my deepest of orange and blue blinders, I could never defend a guy who guessed during every at-bat of his Major League-career; no matter how good of a fielder he was. #1, Little Ricky Otero!!! — if he was 5′ 7″ in the media guide, then I was 6′ 5″. Ha, I was one of those guys. There were maybe two of us in baseball tryouts who pushed back against the Jeter / Nomar partisans. (Alex who?) Yes, watching Rey-Rey “swing” for the fences was enough to make a fan vomit, but his range… his sliding stops on ground balls in the hole were safer than Jeter’s highlight reel jump-throws. I remember going to Shea a few times and watching Ordonez flag down some ground ball shots up the middle as though he were on a Foosball table. Later, of course, he made his most important contribution to the Mets: getting injured in 2000 and making room for the Mike Bordick-led WS run. Wish I were old enough to really remember Mookie. Back in the day I knew him best from the Sportstalk card with (I believe) Bob Murphy’s call of Bill Buckner’s blunder. Ha! I was definitely one of those people who insisted that Rey-Rey was a better FIELDING shortstop than Jeet-uh. And to this day I’ve only seen one better defensive shortstop (Ozzie Smith) in my lifetime. Kind of puts into perspective of how sad it was/is to be a Mets fan sometimes — the best we can come up with in an argument was Rey Ordonez? Ouch. Leo “Warning Track Power” Foster: I still have his Braves rookie card (somehow, I don’t think it is as valuable as the George Brett and Robin Yount rookie cards from the same 1975 Topps set). Thanks for the memories! As for Mookie, he wasn’t that bad of a thrower until coach Frank Howard decided to hit fungoes to the young outfielder during a torrential downpour. Many think throwing back the water logged balls ruined Mookie’s arm. Regarding the lineups of the 70s/80s, you have to keep in mind that the pitching was much better then. It wasn’t as diluted as today because there were only 24, and then 26 teams, and the best athletes tended to go to MLB, not the NBA and NFL. Also, the majority of ballparks were these big, multi-purpose facilities (some would say monstrosities) like Riverfront and Three Rivers, with turf fields. So, teams and lineups were built around speed as opposed to power, and often played for one run early (get the speedster on first, steal second, bunt him to third and get the first run on an out). Agreed on all counts — thanks for the comments. A lot of people who weren’t “there” to see what the game was in the 1970s — for the reasons you mention — and rely specifically on the numbers to rate players and strategies, have trouble understanding why guys like Omar Moreno and Mookie were considered “ideal” leadoff hitters. Many of the same people can’t comprehend Jim Rice’s entry into the HOF … it was a much different game back then. it could have been lance johnson. His premature trade toojk away the leadoff element Bobby V could never find. Great series, Joe. Enjoyed reading it.